Wash the mushrooms and pat dry.Marinate it with peppercorn,lime juice,garlic paste and salt for 30 mins. Spread the cornflakes on a plate and keep aside. Make a batter of maida,cornflour,green chillies and cheese by adding enough water and make a smooth paste. Insert a toothpick through the stem of mushroom.Dip it in the batter and roll it with cornflakes. 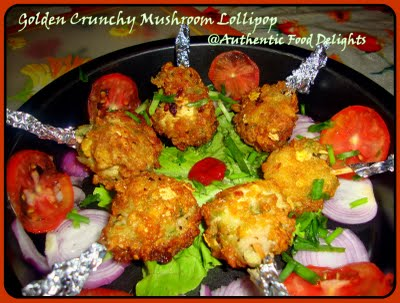 Heat oil in a pan and deep fry the mushroom lollipops till crunchy and golden brown. Priyanka, looks very tempting, thanks for sharing, I want to know, what did you add to the mushrooms, to give them stem like structure of lollypop as visible in the pic? Fabulous ...Really worth trying . Absolutely fantastic. It’s perfect for Barbeque party. Keep it up, thanks for sharing ,happy cooking. its the same cornflakes that you use in breakfast. and if you dont get them so you can also use breadcrumbs. nice recipe bt i wanna what r cornflakes nd where v lll get dm. r dese d same cornflakes which v take wid milk.